As axe throwing grows in popularity as a past time and a sport, the World Axe Throwing League grows as well! With the rapid growth of WATL we’ve decided to add a new member to the WATL team, our new WATL Head Coach Benn MacDonald! We’re proud to say we have the industry’s best on our team as we are all passionately united to improve the axe throwing community around the world! Benn MacDonald was born in Toronto Ontario, and currently resides in Orangeville Canada. 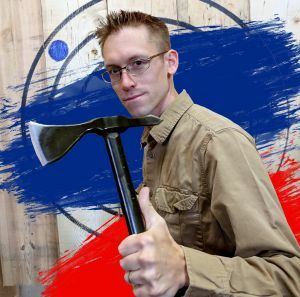 He has been throwing Axes since 2016 and began to coach Axe Throwing in 2017 after opening his own Axe Throwing Range, Far Shot Recreation. At the end of 2017, Benn helped prepare his competitors for the World Axe Throwing League’s World Championship, where Chris Morning, one of Benn’s top competitors, finished in first place. After the World Championship, Benn has pushed his competitors to perform better and has tried to develop new ways to improve. He has enjoyed watching the sport grow and develop. He also enjoys studying competitors throw and observing their throwing styles, watching how they throw and how they can improve, and how their technique could help improve the throws of others. Benn also enjoys Archery and Knife Throwing and has been looking at ways to take his passion in those other sports and translate them into valuable skills for Axe Throwing. When not throwing sharp objects, Benn and his wife Sophie enjoy being with their 4 kids.